The Strange Beauty of Prints and the Pursuit of Knowledge. 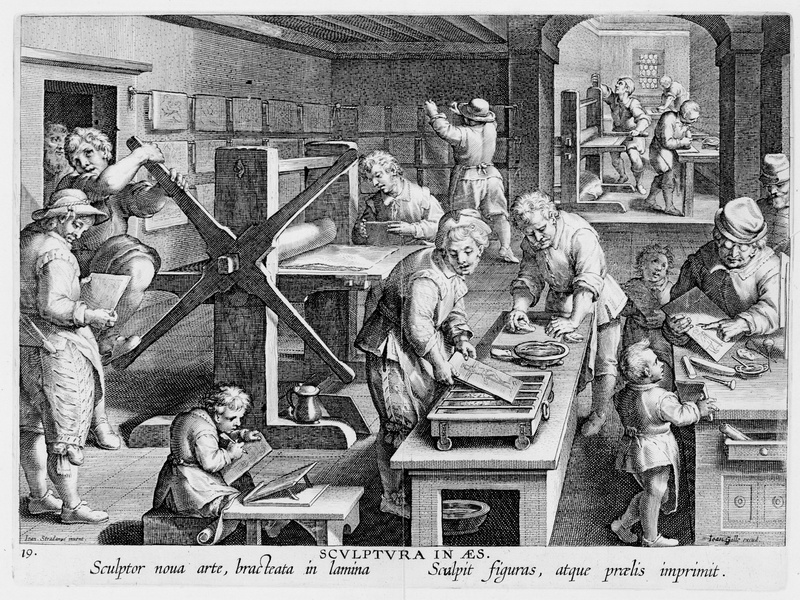 Prints and the Pursuit of Knowledge in Early Modern Europe examines how celebrated Northern Renaissance artists contributed to the scientific investigations of the 16th century. The exhibition and its accompanying catalogue challenge the perception of artists as illustrators in the service of scientists. Artists’ printed images served as both instruments for research and agents in the dissemination of knowledge. The time period covered in this exhibit represents a shift towards direct experimentation and observation of the natural world, away from relying on ancient classical texts for scientific information. While the show is largely prints and books, there are also instruments—sundials, globes, astrolabes and armillary spheres–made from printed paper. There are even flap books showing different layers of internal organs of males and females, early precursors to children’s pop-up books. Some of these has have been assembled from printed reproductions and we are invited to handle them. Accepting the premise of the show catapults me into other questions and fascinations that come from gazing at some of the individual works. I will just touch on a few of my own favorites, here, for the show is vast. The section headings are my own, just to help us all navigate through this review. Holding the world in his hands, surrounded by the tools of his trade, the mathematician and astronomer Nikolaus Petri van Deventer looks off into the distance over our right shoulder as he makes his calculations. Behind him in the distance, a man with a sextant measures the height of the one remaining column of a ruined temple. Although the French at the top of the picture proclaims “Man proposes, And god disposes,” it might be more fitting if it said, “Man is the Measure of All Things.” Petri is shown in the middle of four perfectly formed geometric objects: a polyhedron (probably an icosahedron) on the upper left, an armillary sphere upper right, an astronomical sphere and the globe, on his table. No matter how perfectly curled the segments of his ruff, how perfectly round the nubbins of his buttons, his face and hands are rather lumpishly human…and yet it is we humans who invent, or discover, the perfections of the geometric forms. 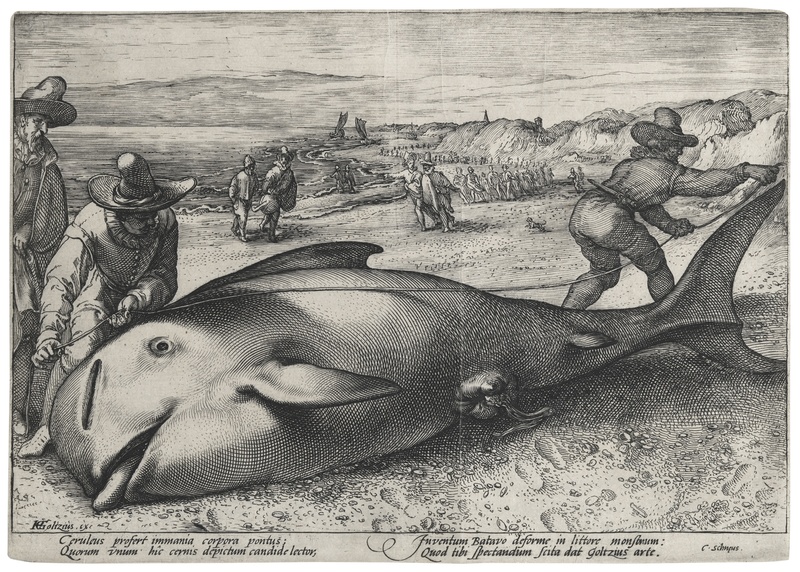 Unknown artist, after Hendrick Goltzius, Pilot Whale Beached at Zandvoort, 1594. Etching and engraving. I was a research scientist for a couple of decades, before turning to the other truth of Fiction writing. When I think of Science, even now, it is associated with the fine black line. For me, the fine black line is the visual counterpart of the Greek or Latin neologisms that flavor so much of medicine and science; it is a sign that the scientific mode of thinking may be involved here. 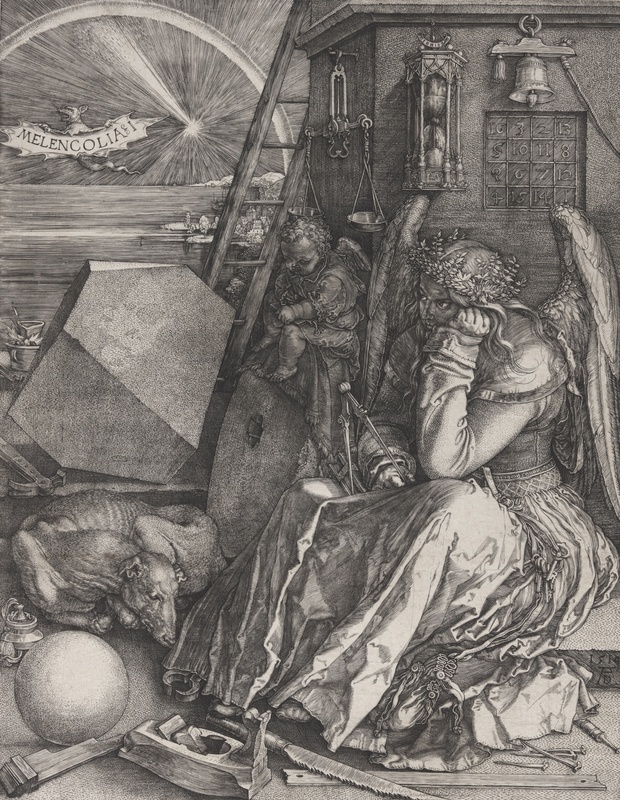 Dürer and some of his colleagues were able to get wonderful detailed lines in their woodcuts, but the copperplate engraving allows another order of magnitude of precision. With the wood block one always has the problem of working with or across the grain while carving, and limits to the amount of pressure and number of impressions one can make before the block itself breaks. Anyway, with the print–either by woodblock or the technological innovations of copperplate–comes the possibility of sudden widespread broadcasting of the new empirical and observational scientific findings. Thus it could be that these 16th Century artist-scientists are in fact responsible for our association of fine black lines with science. I wonder if our notion of sharp ideas or incisive thinking is linked to the sharpness of the engraving tool– the burin–and the way it cuts so finely into woodblock or copperplate. 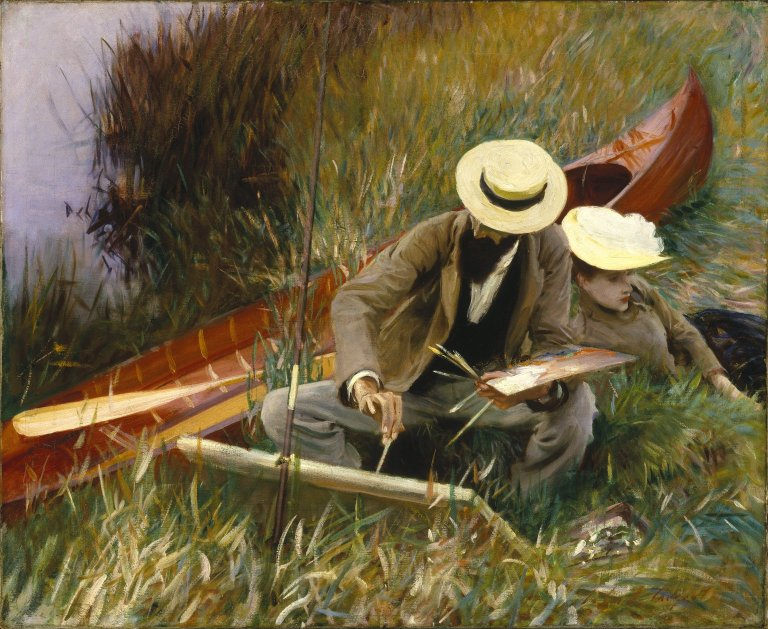 Conversely, fuzzy ideas, or “painting things with a broad brush,” we associate with imprecisions and omissions. This leads me to wonder, What if the technological innovations in art in the 16th century had been not connected with fine woodblock cutting or copperplate engraving, but rather with lithography or some other broad brush process? Would our whole notion of scientific thought and illustration be hugely different? I am reminded of Junichiro Tanizaki’s odd little masterpiece, In Praise of Shadows, where he conjectures what would have happened if the modern hospital had been invented in Japan, with its shadowy interiors, sliding paper panels, and floors made of woven grass. 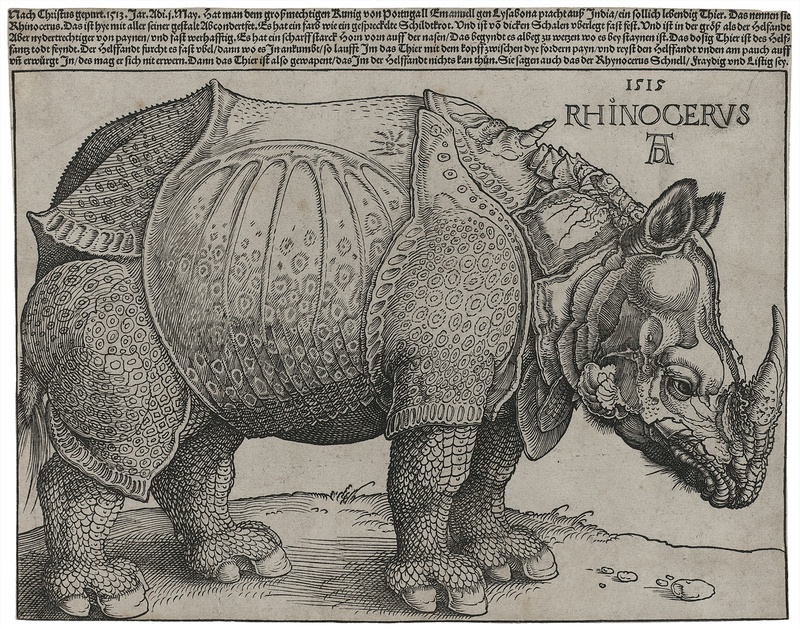 Albrecht Dürer, Rhinoceros, 1515. Woodcut and letterpress. For ages, this image has been the iconic rhinoceros for me. Even though I have seen such beasts in the zoo, it is this picture that I believe. I know that they are not as reptilian or scaly, in real life. I know that they don’t have plates like an armadillo. But still, this is the picture I would grab, needing one of a rhino. Even though this is a woodcut (with letterpress at the top for the writing), the black lines are so fine that if you zoom in, or blow it up, you’ll see every hair lining the ears, every bristle on the muzzle. For years and years I had a print of this hanging in my house. I never noticed that inaccuracy, that piece of un-truth: that second horn, the spiral one projecting from between the beast’s shoulders, pointing toward the “R” of Rhinoceros. Discussing this horn, the catalogue mentions that Durer never saw the animal himself, and worked from notes and sketches of someone who had seen it in Portugal, the first Rhino to come to Europe since the 3rd Century. I know that dorsal horn is “wrong.” But with all those fine black lines, all Dürer’s genius and virtuosity, it is hard to disbelieve. What a relief! She is not full of black bile! She is deep in the work of the imagination. Each side and each diagonal add up to 34. So do the four inside numbers. So do the four corners. So do the facing inner pairs of numbers on opposite sides. 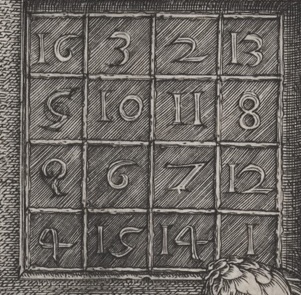 The date of the print, 1514, is centered in the bottom row. 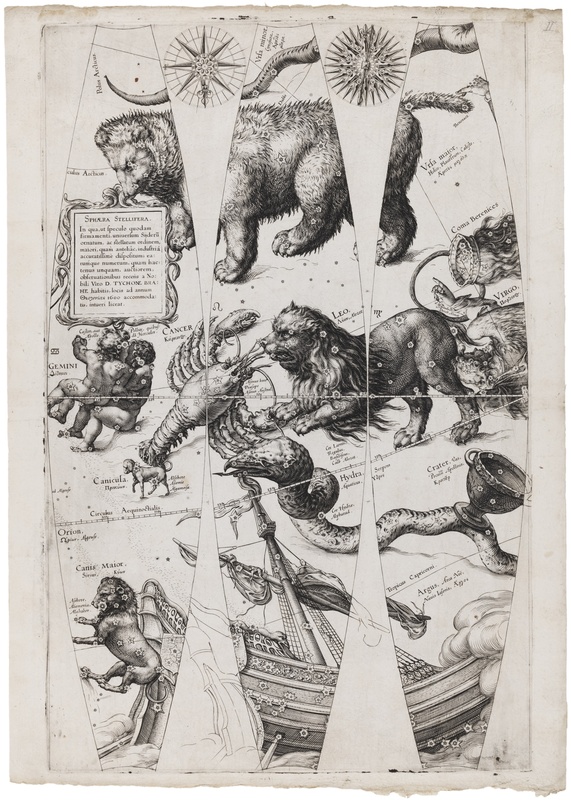 The catalogue of this exhibition tells us that Dürer was the first one to make prints of celestial charts of constellations and planets. 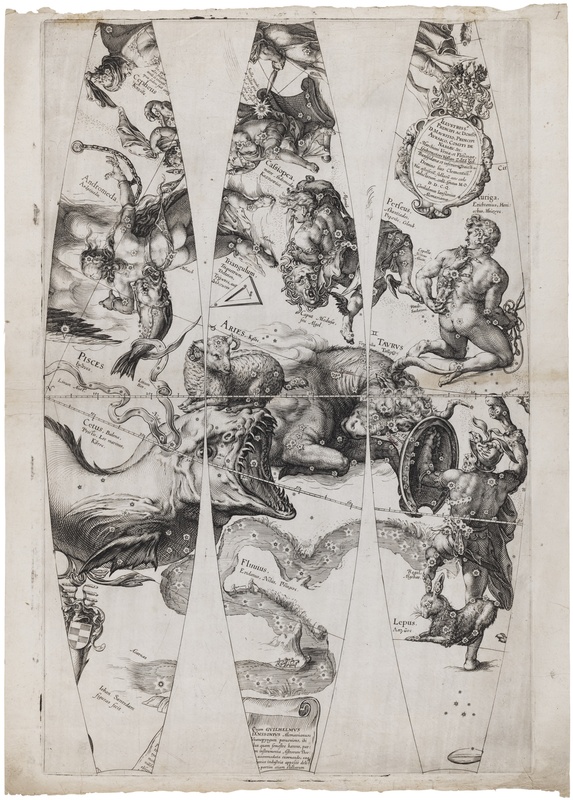 Soon after that artists began to adapt such charts to long oval gores as in the 3 sheets below by Saenredam. (There had been a 4th sheet, but is is missing.) These gores were meant to be cut out and then bent and glued onoto a wooden sphere, which they would cover except for caps at either pole. There are some examples of such celestial globes in the exhibition that can be handled. 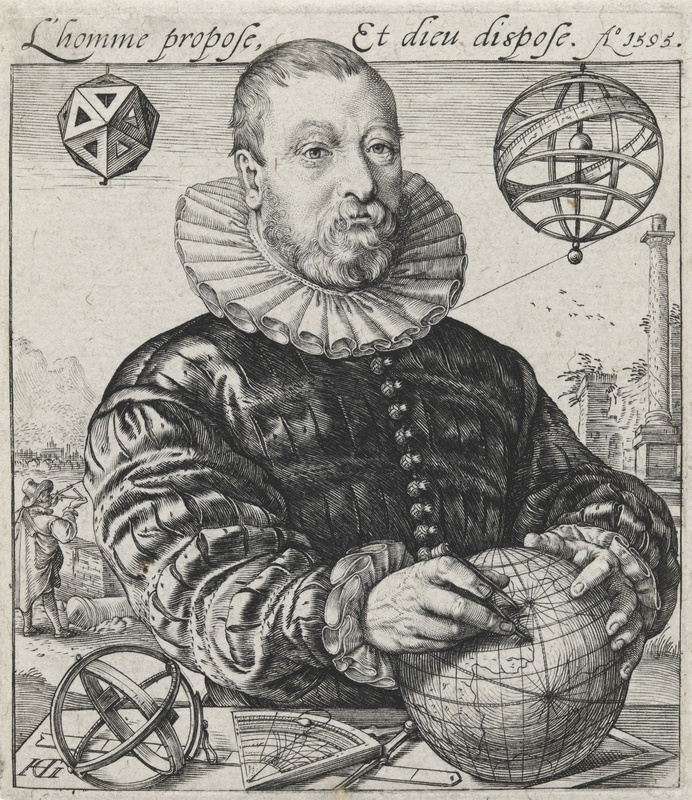 Jan Saenredam, from Celestial Globe Gores for Willem Jansz. Blaeu’s Sphaera stellifera. Before 1600. But standing on the earth, we are inside the heavens. A proper model of the constellations and planets would be a sphere surrounding us. But if the printed gores were glued to a hollow sphere, face down, that is, facing something inside, we couldn’t see inside, or if we could, through peepholes, say, it would be extremely awkward. So the artists and scientists who made these celestial globes made them analogous to the usual terrestrial globes, facing outward, but with constellations instead of land and sea. 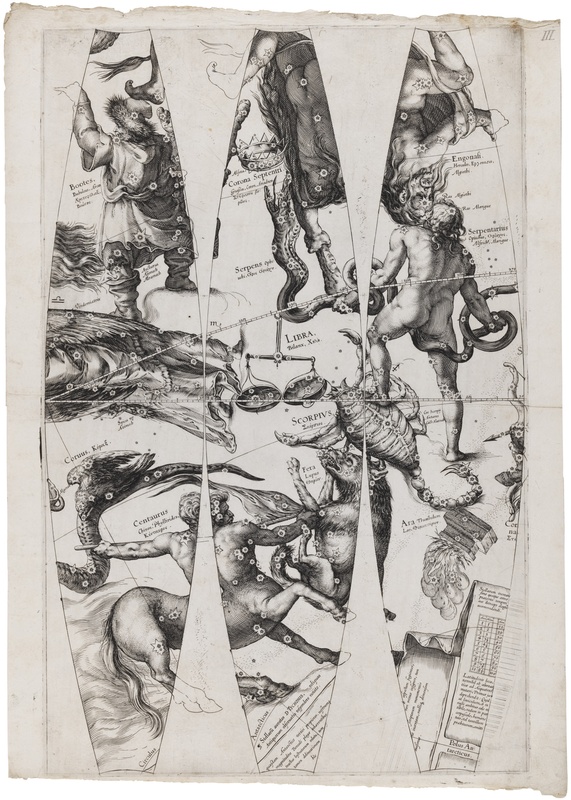 Cornelis Drebbel after Hendrick Golzius. Arithmetic, from the series The Seven Liberal Arts. After 1587. Engraving. 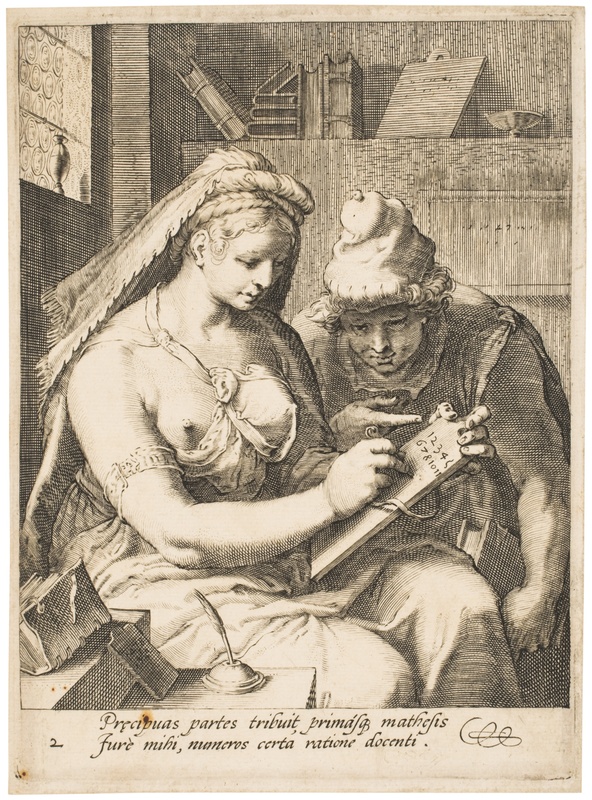 Here, Arithmetic, personified as a hefty blond goddess, is teaching the numbers to her young male companion. Something odd has happened to her filmy bodice and one of her breasts exposed. Then, as now, the naked bosom captures our attention, and many of the allegorical figures in this exhibition are women in extreme conditions of undress. The fine black lines here, along with the geometric forms taken by the books on her shelf, and the rondels of glass in the window make us believe in the truth of the lesson. But something odd is going on here as well, for she has left out the number 9. (Zoom in if you need to, its absence is very clear.) Neither the catalogue nor the wall notes mention this, so it is ours to question! Is this a form of copyright protection, to insert a known “wrong,” and see if it gets promulgated? Did the student not pay the full price for his lesson? Does the word for 9 in Dutch have an obscene ring to it, the way it did for Isak Dinesen’s Swedish teacher of Swahili? Or is the number 9 occult or mathematically esoteric, that the student may not learn it yet? Can you “cast out nines” before you even learn of their existence? In any case, for me this was another case of the fine black line giving the illusion of accuracy, leading me into the belief that I was seeing the full array of numbers on her tablet, until I finally saw the puzzling omission. Note that I’m not saying that the fine black line is there to trick us. Not at all. For years I was a microscopist and I still love the finest lines, the highest resolution. But those fine lines have to deserve our belief in their veracity. Here we see not the process of inventing, but what happens during that process, which had been recently invented. In the lower left a boy on a bench copies a drawing, engraving it onto a copper plate. In the middle, the first figure heats the plate, while the one behind is either rubbing ink onto the warm plate, or rubbing the excess ink off. Behind them, to the left, a plate hidden by the paper lying on top of it, is rolled through the press, which so heavy that the man in the far left must put his foot and body weight to push on the lower spoke as he pulls the upper one toward him. In the back of the room the prints are being hung on racks so the ink will dry. I kept expecting that the plates they were working on would show the very scene we are looking at, in the manner of Escher–a mise en abime, also known as ‘the Droste effect.” But though they are hard to see, the one on the left looks like architectural drawings, the middle one a crucifix, and the one on the right a man leaning on a stick. But Stradanus and his engraver were not playing this game. In any case, this image of the printing process made me wonder about making visible the tools and elements of art. The tools for scientific observation and measurement–telescopes and compasses and dividers and rulers and gnomons and sextants occur throughout the prints having to do with mathematics or astronomy or navigation; we see a (flawed set) of numbers in the allegory Arithmetic, and in the magic square of Melencolia 1 we see some elements of Number Theory. 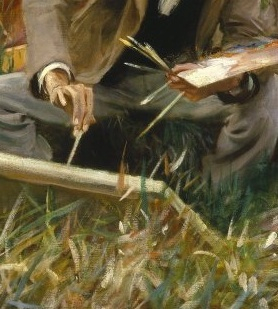 John Singer Sargent An Out-of-Doors Study c. 1889. Oil on canvas. Andreas Vesalius, and unknown woodcutter. Title page from Vesalius De humani corporis fabrica libri septem (Seven books on the fabric of the human body). 1543. Woodcut and letterpress. 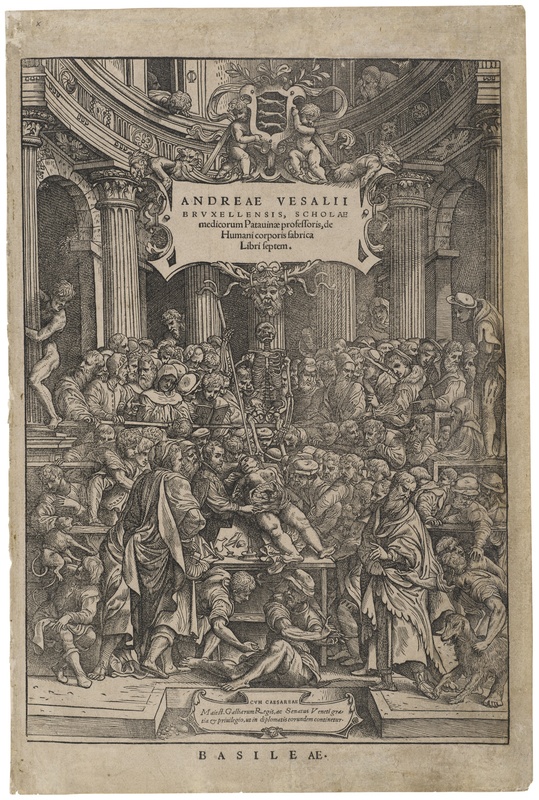 This is the title page from an anatomy book by the scientist and artist, Vesalius, showing an anatomy lesson where he is performing a dissection. Taking place in an amphitheater, it’s sort of a circus: a monkey is at the left hand margin; a dog in the lower right corner; a skeleton hangs above the cadaver; a naked man leans from an alcove, as though we were a statue come to life. What is art, what is science? I used to be a scientist. Now I am a writer. This is an exhibition about the world of science, and the way that 16th century artists influenced that world. You would think that I would be able to think about this sanely, if not answer it. Perhaps we can reduce the question to something more manageable: if we look at any one of these prints, and read the wall notes, can we tell if it is art or science? If, like Edmund Burke, we feel that beauty depends on some specific physiological response (e.g., its pleasure depends upon something like a relaxing effect on the fibers of the body) we might call a smaller number of them beautiful. But, if–as in Kant’s Critique of Judgment–we insist that the purely aesthetic response to an object of art is essentially without rules, and is focused on those aspects of the work that were conceived with no purpose, although deeply purposive, then our view of whether Science or Art is the primary terrain of these prints–star charts and beached whales, anatomy lessons and allegories–would lean further toward Science than toward Art. Could one say that Art leaves out everything it can, while Science puts in everything it must? Not because it can all be parsed at once, but so it will be there when you need it; it is valuable to have as much information as possible in one place. Scientific prints can be amazingly dense and many of the ones in this show are mind-boggling. Rembrandt . 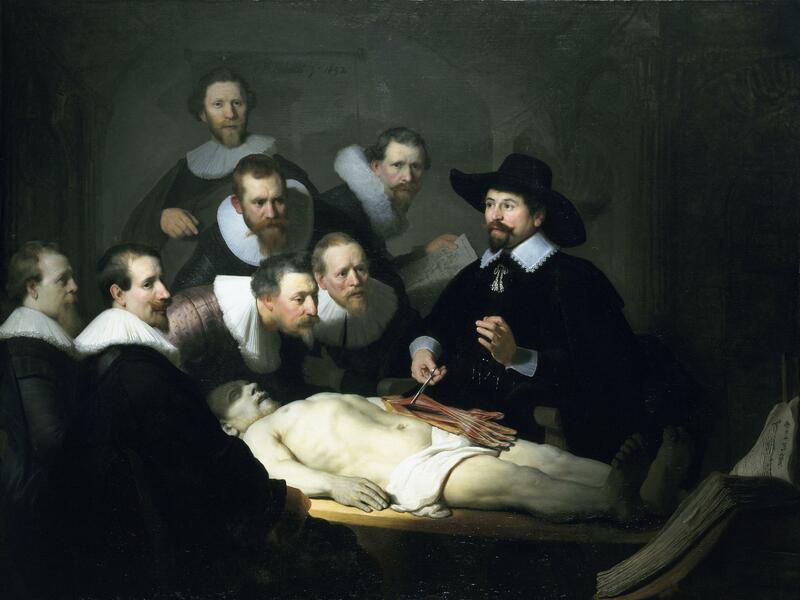 The Anatomy Lesson of Dr. Nicolaes Tulp. 1632. Oil on Canvas. Mauritshuis, The Hague. Photo: Wikimedia Commons. Herman Braun-Vega. The…Lesson in the Country. 1984. Acrylic on canvas. In this homage to Rembrandt, the Peruvian painter Herman Braun-Vega keeps five of Rembrandt’s onlookers. He has replaced Dr. Tulp with an officer of an undefined Latin American country. 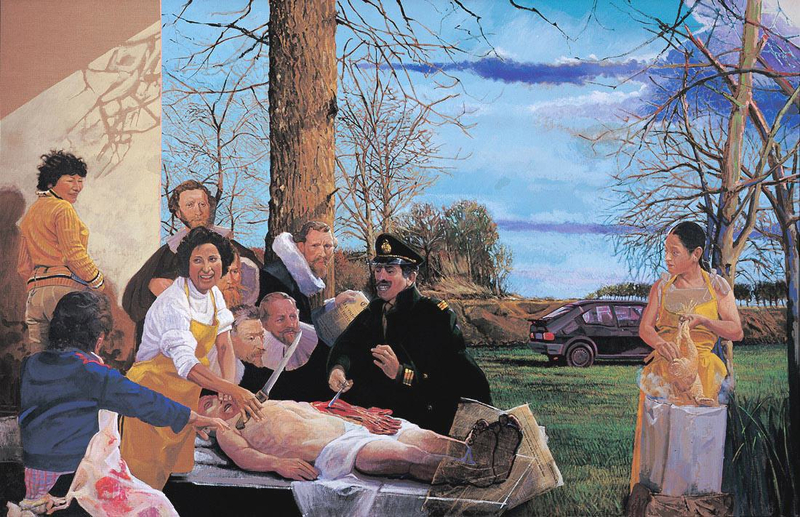 Three local people pay no attention to what is going on with the army officer and the cadaver; a woman a few feet away acts as witness, but does not stop plucking her chicken. The picture is influenced by photographs that were taken of Che Guevara right after he was killed, though the corpse itself is taken from Rembrandt. There are only two more figures in Braun-Vega’s version, ten in all, but because of the social and political intentions of the artist, our response is no longer the breathtaking and sudden consciousness of mortality that we get from the Rembrandt painting, but flies out in many directions and contains strands of guilts and puzzlement as well as reactions to the vibrant palette. By adding the intentionality of sociopolitical consciousness, has the artist diluted our aesthetic response? I see that my question has turned into: where does our intellectual response leave off and our aesthetic reaction begin? Or vice versa. It could be a case of “the farther off from England the nearer is to France,” and all these prints are inviting us to a Mock Turtle’s Quadrille of Art and Science. Perhaps we could say that a great work of art interrogates us. The Title Page of Vesalius does not do this (for me), but Rembrandt’s Anatomy Lesson does. We might not have to change our life after seeing Dürer’s star charts, but we might after studying his Melencolia-1. When he is a scientist he informs us; when he is a psychologist he moves us; when he is a theologian–for I do think Renaissance artists often act as silent and vehement theologians–he can terrify us (*). And when he is an artist he asks us to explain who we are. Prints and the Pursuit of Knowledge has the strange beauty and density of a scientific diagram or star chart. You can’t examine it deeply all at once. It is best to take a certain reading, see what questions arise, and then go off alone to your lair to think. (*) For examples of this, see my book Hinges: Meditations on the Portals of the Imagination.